Pool Live AR Is An Augmented Reality Tool For Billiards Or Pool Games. Pool Live AR is an augmented reality tool, that is developed by Portugal-based digital solutions company Forge IT is changing the games of pool, Snooker and billiards with their augmented reality (AR) product dubbed Pool Live Aid. They have used a short-throw projector and 3D depth camera system that tracks the player’s aim and the cue stick’s movement in real time. 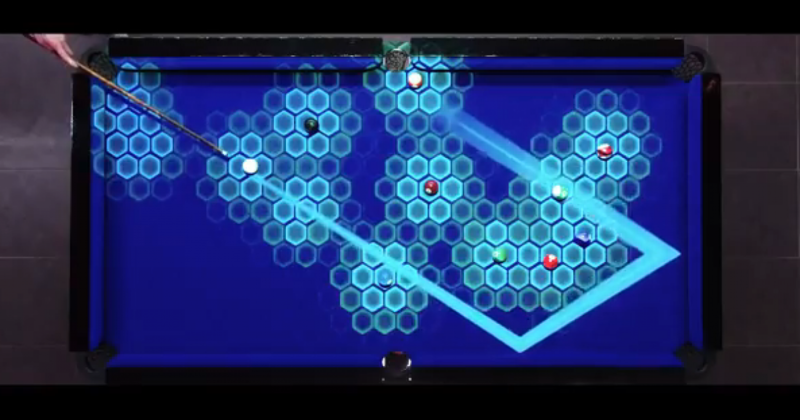 This astonishing Pool Live Aid’s AR system creates an optimal path for the white ball to do its job of knocking other balls into the appropriate pocket. Using only a projector and a camera, placed above the table, it can can detects cue, balls and tables boundaries. The system also projects in real time stunning effects, score or help lines onto the table, benefiting both amateur or professional players, or even technology enthusiasts. This is an updated version that they made first. It even accounts for how the table’s cushions affect the trajectory with remarkable accuracy. While old-school hustlers and ESPN stars may scoff at this technological assistance, but you’d be hard pressed to think of a better tutorial for your pool, Snooker or billiards skill sets.